If there is another team as schizophrenic as UP this season, it is UOP. They won three of their first seven conference games by a total of 5 points. Then they beat UP by 9. Since they've lost six of seven games, but the win was @BYU by 5. They followed up that nice win by losing two at home to LMU and Pepperdine; they did take PU to overtime. They lost handily at GU on Thursday. No idea what mindset they'll have this game; they've got no tournament to play for. Las Vegas has Pilots favored by 4-1/2, with an O/U of 150. Last time their G Bowles went for 19; he averages 11. Their other G Kobre can also score; he got 22 against PU. Hopefully the coaches have another good game plan, the players shake off the disappointment of Thursday night, and Pacific goes home with another loss. There is a brewfest prior to the game, so there's no excuse for a quiet Chiles Center tonight. Waiting for nopo's end of half well coached composed team stuff. Once again, my paper airplane failed to make it to the court. Still perfect when we are up by 14 with five minutes left. blacksheep wrote: Once again, my paper airplane failed to make it to the court. Was yours the one that hit me in the back of the head? Mine finally made it to the floor this year (and not the back of someone's head like I have done the past few years). Reveno not only tweets, but breathes and arguably learns. End of first half the Pilots do well . . .hmmn. When the opponents fans agree about the quality of play from Alec, well, we might have something. Great team win on senior night. It's good to see the Pilots comfortably take care of a team they should be expected to beat. The defense on this homestand was great. Pressley shined in both games. He deserves a lot of credit for finding numerous ways to consistently make the team better, even in the midst of a major three-point shooting slump. He did make a few threes over the past couple of games, so maybe he'll be back on track for the rest of the season -- timing would be great if that were the case. And yes, great to see us close out the first half with purpose and momentum. Last home game for Pressley and Livingston (too bad Max couldn't get a shot to fall), and apparently also for the strength and conditioning coach... Remains to be seen if any other players and coaches also made their final Chiles Center appearances. NoPoNeighbor wrote: Last home game for Pressley and Livingston (too bad Max couldn't get a shot to fall), and apparently also for the strength and conditioning coach... Remains to be seen if any other players and coaches also made their final Chiles Center appearances. Yup, that has to be the big question mark as we head toward the season's end, and yea, I guess Brad Scott is leaving....I kept asking what the way too loud and too often PA guy was yelling about Brad, but no one seemed to know. The game was not nearly as entertaining as the SMC game two nights earlier, but it would be darned hard for any game to match that one. UOP is very, very physical and emotional too....led by senior, #12 Thompson. Rev had warned/opined that the game could be won or lost at the foul line, as he wrote: "Last time we played Pacific they shot 34 FTs to our 15. Need to match their physicality without fouling...." And the Pilots responded, hitting a season high 30/32 from the line, while the Tigers were a comparatively paltry 9/20. To say it was an uneven performance by the Pilots would be an understatement, but Pacific is another of those teams that makes it very difficult for the opposition to get a rhythm going....just ask BYU about UOP after their loss to the Tigers in Provo a few weeks back. The Pilots win was marked by their teamwork and toughness....and Ray held his own against UOP's very physical/talented Thompson, but I'm not sure UP can advance beyond the first game of this year's WCC Tournament without some offense coming from the front court. Kudos to the athletic department for honoring the seniors on the dance team and pep band, and even the two seniors on UOP's squad. Will miss visiting with Harold and Laura Pressley....and Bryce's wonderful grandparents and siblings too!! Wintering is certainly spoiling us as Pilots fans. He scored 27 points last night, but that didn't receive any special comment here on this board -- myself included. It is amazing that this is just what we've come to expect from him. Anyone scoring 27 points in any game over the last several years for UP would have been huge news. Wintering has raised the bar, big time. He's 2nd in the conference in scoring in league games! 21.8ppg to Wiltjer's 22.3. After Alec's and Bryce's 27 and 15 points respectively, good to see D'MArques and Jarrel with 10 points each, and Gabe with 8. Not a perfect game by far, but great win. I told everyone within earshot I would post a written apology to last night's refs if my hysterics over their missed goal-tending call was in fact not goal tending at all. Well, upon further review on the TV today, their missed call was even worse than it originally appeared. Not only did the ball hit the backboard before it was swatted, it was also in the cylinder when it was poked away. No apology needed or given. I'm told you and Blacksheep disturbed some of the more delicate fans in attendance with your protestations. up7587 wrote: I'm told you and Blacksheep disturbed some of the more delicate fans in attendance with your protestations. Per Rev on his radio show, Brad Scott is going to the Atlanta Braves. Brad has to report spring training at Disney World in a matter of days to begin his new job as the "Performance Therapist" with the Braves. Great opportunity for Brad, but he will certainly be missed by the student-athletes and coaches. Brad was in his 9th year as the Assistant Athletic Director/Director of Athletic Performance at UP after coming from USC in 2007. I've been told he will be in the dugout and will travel with the Braves the entire season, so it will certainly be a different kind of grind for Brad, but I'm quite sure it was opportunity he just couldn't pass up, regardless of how much he enjoyed being a Pilot. Hmm, I bet he can get us tickets....I've got to check the Braves schedule. I'm sure the next time the Braves are at Vaugn Street Park we'll all get invited. DoubleDipper wrote: Hmm, I bet he can get us tickets....I've got to check the Braves schedule. I hope you like traffic and/or Cobb County (in the future). That's a great opportunity for Brad to pick up and I am happy for him. The Braves upset me because they were gifted a free stadium from the centennial Olympic Games and they decided that it's not shiny enough anymore for a whole host of reasons. Time for a new one! Braves are in San Fran at the end of August. I'm sure you'll be there. up7587 wrote: Per Rev on his radio show, Brad Scott is going to the Atlanta Braves. I've corresponded with Brad on a couple of occasions while he's in spring training, and from what he's telling me, it would appear it's a good thing he'll be working on athletic performance with the players, not with the fans. 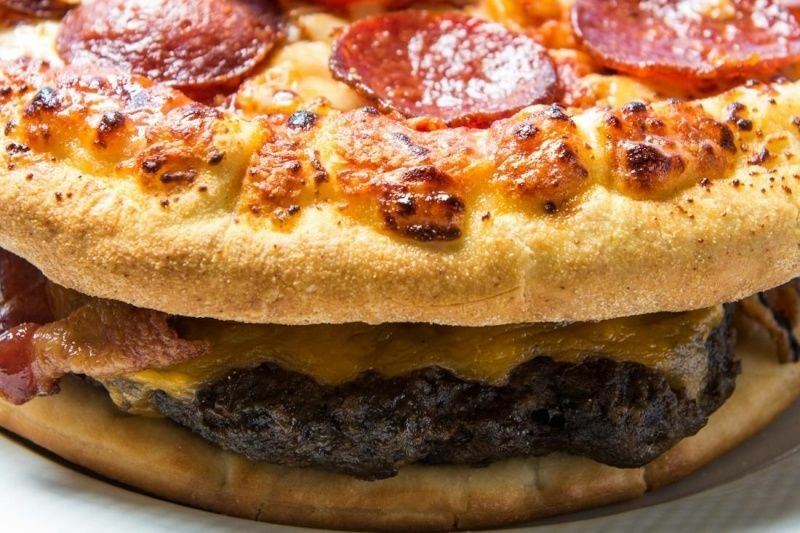 Leading the way is the "Burgerpizza", a grilled 20 ounce beef patty covered with 5 slices of cheddar cheese, topped with crispy bacon, and served between two 8-inch pepperoni pizzas. Just $26, not including an angioplasty. Feeling too full now to describe much more, but the Braves can also offer you the "Everything Dog" which includes a foot-long hot dog layered with fries, chili, nacho chips, beer cheese, jalapenos and topped with popcorn and then drizzled with Coca-Cola infused BBQ sauce served on a pretzel bun. A bargain at $15. Still hungry? Try the "Tater Top Chop," or the "Punisher," or my favorite, the "Sausage Sundae." Smoked sausage split down the middle, topped with macaroni-n-cheese, mashed potatoes, and pulled pork, finished off with BBQ Sauce.....and for you health freaks, at the very top, a cherry tomato.